The stated intentions and aims of both the 2011 UK National Ecosystems Assessment (UK NEA)1 and the 2014 UK National Ecosystems Assessment Follow-on (UK NEAFO)1 included awareness-raising and knowledge transfer to broker change across all sectors of society. Publication of the UK NEA in June 2011 was a global landmark, and it still remains the only such national assessment. At 1,466 pages, the hardback report is undoubtedly impressive. However, it is hardly accessible to lay and non-scientific readers. Making the contents available and usable for policy-makers, planners, educators, economists, business people and other constituencies presents a further challenge if the UK NEA’s rich insights and lessons are to influence practice. One of the more accessible outputs of the 2011 UK NEA was an 85-page Synthesis of The Key Findings2, summarising the NEA process and its key messages with some supporting detail. Some diagrams within the synthesis report were politically useful in displaying complex information all on one page, such as the importance of the eight broad habitat types for the provision of different ecosystem services and the direction of change in the flow of these services over the previous 60 years. However, compact though this summary information may be, these big tables with their various colours and arrows are not ideally suited for wider public comprehension and use. The Department for Environment, Food and Rural Affairs (Defra) helpfully published reading paths for the 2011 UK NEA reports, adapted to the interests of different constituencies: policy-makers, businesses, educators and researchers, for example. However, wider awareness of these reading paths was low, and readers still had to grapple with a maze of technical content to reach the elements that were most useful for their priorities. Today, these reading paths are inaccessible if they exist at all in the labyrinth of the amalgamated GOV.UK website. In conclusion, effort expended on communicating UK NEA outcomes to those who might have used them for sustainable change was slight, though a number of people involved with the NEA subsequently wrote and spoke about them in the various media. natural capital into UK accounts, and developing tools and products to operationalise the Ecosystem Approach. Consequently, the UK NEAFO paid greater attention to tuning outputs to user perspectives and needs. Researchers, research funders and research users. extremely helpful in showing me just how high-handed‘experts’ can be in judging what is comprehensible and interesting to this reading age! report, which may not have made them immediately visible or accessible to the target communities. Principle 1: the objectives of management of land, water and living resources are a matter of societal choices. Principle 2: management should be decentralised to the lowest appropriate level. Principle 4: recognising potential gains from management, there is usually a need to understand and manage the ecosystem in an economic context. Principle 8: recognising the varying temporal scales and lag effects that characterise ecosystem processes, objectives for ecosystem management should be set for the long term. Principle 9: management must recognise that change is inevitable. Of course, publishing a report is far from the end of communicating with plural audiences, particularly with those who need to take informed action. ‘greenest government ever’! This threatens not only to waste substantial public investment and the additional voluntary commitment behind the NEA process, but also opportunities for steering our collective activities onto a more sustainable pathway. Through technical media such as environmental SCIENTIST, and more general media such as the BBC, via the radio broadcasts that I have made, a cross-section of sensitised publics may become interested or even engaged in UK NEA outputs. But what about the majority who may be unaware of them, and to whom such communication may be entirely invisible? The environment is far too important to be left to environmentalists alone. Indeed, if we in the broader environmental community, howsoever defined, are ultimately seen as the ‘owners’ of the Ecosystem Approach then all is lost. After all, the twelve complementary and interlinked principles of the Ecosystem Approach (see Box 1) set out by the Convention on Biological Diversity4 speak not merely of the ecosystems that provide the most fundamental resources underpinning human needs. They also explicitly address issues of societal choice, decentralised management, the wider spatial and temporal ramifications of decisions, economic context, preparedness for inevitable change, consideration of all forms of knowledge, and the involvement of all relevant sectors of society in decision-making. All of us in society, environmentally astute and illiterate alike, ultimately share common interests and a common fate, co-dependent on and thereby conjoined as we are by the beneficence of nature. Senior colleagues and I have debated for some years whether we are bold enough to begin dropping the ‘eco’ prefix. The mere mention of ‘eco-anything’ suggests to many that this is all to be delegated to the ‘greens’. But this is not what the Ecosystem Approach is about at all. Instead, we should be talking about a systems approach, within which there is an implicit understanding that supporting ecosystems stand as axiomatic alongside economic, social and equitable considerations. Is society ready yet to realise that ecosystems are a fundamental, not altruistic, concern? Three analogies I have used frequently during my past three decades involvement in developing and applying ecosystem service concepts seem appropriate to the challenge of communicating with plural audiences. The first analogy is describing ecosystem services as ‘the verb of nature’. We are not, as some mischievously or mistakenly perceive the concept, seeking to put a price on nature in describing its services. The UK NEA conceptual framework acknowledges the underpinning contributions of geodiversity and biodiversity across all layers, including to final services beneficial to people: ecosystem services are all about what nature does for us, hence describing them as ‘the verb of nature’. The verb analogy introduces to wider publics a key understanding both of what ecosystem services are (and also are not) but also, importantly, about the importance of the natural world for many of the services – fresh water, clean air, soil formation and fertility, recreational resources and natural beauty, natural flood control and so on and on – that we have for too long taken almost entirely for granted. The analogy brings nature ‘in from the cold’ for many who may have not to date questioned how reliant they are upon it. The second analogy, and one that resonates strongly with participants in public dialogue work I have done around ecosystem services, is that of the iceberg. This relates to the vast bulk of ecosystem services that defy ready quantification and valuation, but which are essential for the resilience and functioning of all ecosystems and their capacities to provide us with those other services we more directly consume and value economically. Particular amongst these are supporting ecosystem services and several of the regulatory services, which are recognised as ‘intermediate services’ in the UK NEA valuation model to ensure that they are not double-counted along with the ‘final services’ to which they contribute. It is nevertheless important that all such ‘intermediate services’ are included in some way in decision-making, as continuing to overlook or undervalue them risks perpetuating the very cycle of ecosystem degradation through oversight that the ecosystem services concept was developed to interrupt. Interestingly, I have found that most members of the general public tend intuitively to understand the iceberg: that nature is always present unseen below the surface, supporting the 10 per cent or so of services that we use directly, and so its protection is a high priority as an investment in future security. By contrast, I have found the concept harder to communicate to technical and policy audiences, who tend already to have a focus on a subset of services nearer market (such as food, timber and exploitable water resources) or already embraced by regulations (including management of flood risk, water quality and pollution control), but perhaps less so on the systemic workings of nature from which these focal services arise as integral elements. The central thrust of the transition to decision-makers recognising and incorporating the value of ecosystems and their services is precisely about recognising the ‘submerged’ 90 per cent of this metaphorical iceberg of nature that bears our weight and supports more visible and tangible needs now and into the future. 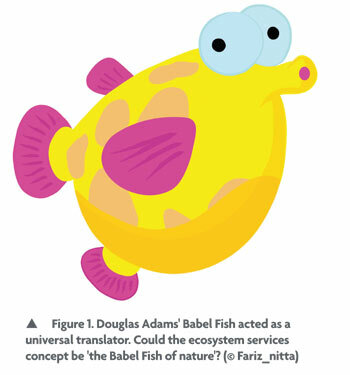 A third analogy on which I have commonly drawn is that ecosystem services are a kind of "Babel fish of nature", borrowing from The Hitchhiker’s Guide to the Galaxy5. The practical use of this fish was that, when inserted in the ear, a person could instantly understand anything said to them in any language. All analogies are germane to the important mission of communicating with plural audiences using references meaningful to them, and certainly reaching out beyond the relatively narrow technical circles within which the UK NEA and UK NEAFO are currently understood. The third analogy, the role of the ecosystem services framework as a universal translator, is perhaps the most important. The origins of contemporary ecosystem services concepts in the late 1980s specifically sought to capture the multiple ways that different people use and value what the natural world does for them. Harmonisation under the UN Millennium Ecosystem Assessment6 in the mid-2000s of many pre-existing ecosystem service typologies from across global bioregions and habitat types into a consistent ecosystem services categorisation followed the same objective. This was to reflect multiple benefits and diverse value systems, ranging from those that are more tangible (food, fuel, fresh water and so on) through the more culturally subjective (such as spiritual value, aesthetics, sense of place and community formation) to the underpinning life support services sustaining all others (soil formation, pollination, natural hazard regulation and others). The value and importance of ecosystems can thus become evident to a wider cross-section of people by recognition of and communication around the particular value systems they hold. This diversity of values and value systems in different sectors of society, from local to global scales, is axiomatic in the concept of ecosystem services. We allow it to be subverted by a narrower focus on unitary values, be they monetary or other, at our considerable peril. Developments under the UK NEAFO in expanding on cultural values, and also shared and plural values, make a useful contribution here, as does the focus on practical tools through which decision-makers can elucidate the diversity of societal values through dialogic processes, better to inform robust and more inclusive and sustainable management outcomes. Communicating to plural audiences remains challenging, but is essential for engaging all in society in more connected decision-making, technological innovation and choice. Communicating is also essential for resource use and management practices that better safeguard and help rebuild natural infrastructure fundamental to longer-term wellbeing. We have to learn to communicate more intuitively and with greater impact about the many ways in which nature confers meaning and value – whether in business, technology, art and music, local and central government, academia, rural communities, retail or as consumers – so that all of society can take appropriate action based on their unique perspectives and essential contributions to achieving a sustainable future. 1. UK National Ecosystem Assessment http://uknea.unep-wcmc.org/Home/tabid/38/Default.aspx (Accessed: 14 November 2014). Default.aspx (Accessed: 21 November 2014). 3. UK National Ecosystems Assessment, (2014) Synthesis of the Key Findings uknea.unep-wcmc.org/Resources/tabid/82/Default.aspx (Accessed: 21 November 2014). 5. Adams, D. (1979) The Hitchhiker's Guide to the Galaxy. Pan Books, London. 6. Millennium Ecosystem Assessment (2005) ) Ecosystems and Human Well-being: Synthesis. www.millenniumassessment.org/en/Synthesis.html (Accessed: 21 November 2014).